Guar gum, an aa cried guaran, is a galactomannan. It is primarily the grund endosperm o guar beans. 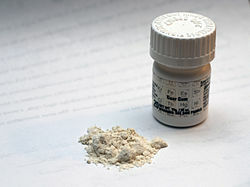 The guar seeds are dehusked, milled an screened tae obtain the guar gum. It is typically produced as a free-flawin, aff-white pouder. ↑ "foa.org" (PDF). Retrieved 2011-04-18.